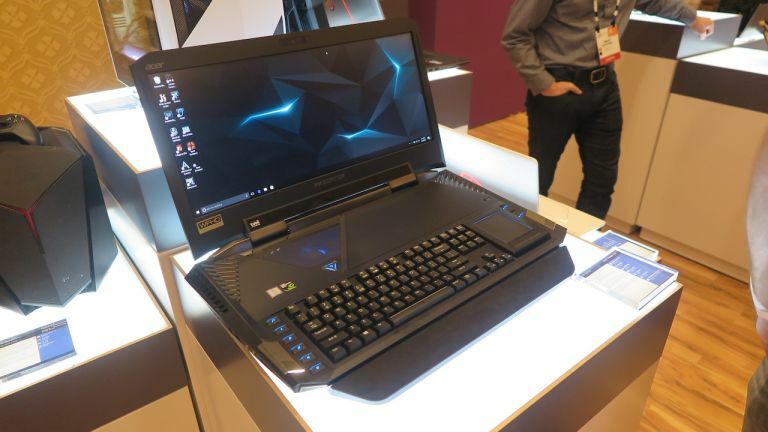 Acer revealed the Predator 21 X at CES 2017, a $9,000 (£7,406) gaming laptop that, right now, is the closest you can get to extreme PC gaming tower performance on the go. Under the bonnet of the 21 X you’ll find a seventh-generation Intel Core i7 processor and two Nvidia GeForce GTX 1080 X graphics cards. What's more, neither of the GPUs are watered down mobile versions, but instead the full fat desktop editions. In addition, the Predator comes rocking 64GB of DDR4-2400 memory. Enthusiasts will also be pleased to hear that Acer has designed the Predator 21 X to be overclockable too - a fact that contributes to the brace of power supplies needed to fuel this desktop-imitating beast. Indeed, Acer really have pulled out all the stops in imitating an elite gaming tower PC setup, as the Predator even comes with a fully mechanical keyboard, while the trackpad to the right of it can also be flipped over to reveal a number pad too. Naturally, all this top tech means that the Predator 21 X weighs in at a beefy 8kgs, which means that while it can be carried around, you're certainly going to get a workout while doing so over large distances. From what we can see, the only other slightly underwhelming part of the 21 X is its fairly standard 21-inch curved 1080p display — however the rest of this laptop is jaw dropping, for better and for worse. Arguably, for almost £7,500 you could build an even greater monster of a desktop PC, but this laptop isn't meant to be a practical solution for getting the most power for the least amount of money, but an elite-level solution to enthusiasts and professional gamers.